Happy Saturday!! I am linking up with Joanne at Head Over Heels for Teaching for her awesome Saturday linky - Spark Student Motivation. Be sure to head over to her blog and check out all the ideas being linked up. Today I am sharing on idea that we use to motivate our whole school to show school spirit. At our school we have a monthly "Spirit Assembly". My BFF and I organize them along with our Student Council. 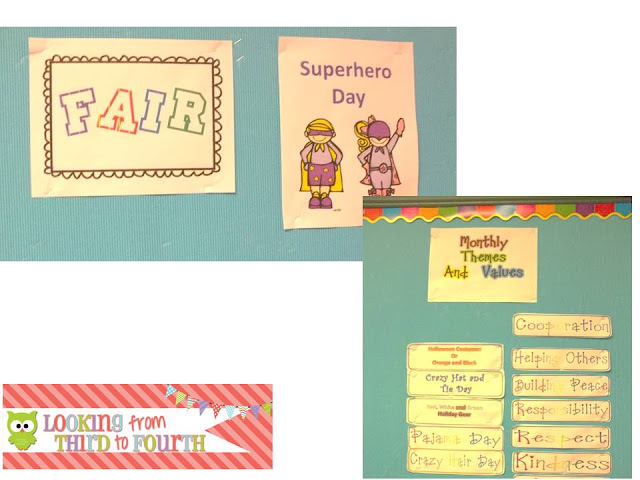 At the beginning of the year we pick a theme and value for each month. On our Spirit Assembly day we all go down to the gym - dressed in our themed gear and announce winners for the Value of the Month Brag Tag, sing Happy Birthday and hand out birthday brag tags, highlight sports teams and student achievements and play a game or do a little dance! This month our value is "Fairness" we are focusing on Sportsmanship and we will dress up like a superhero! A few years ago we decided to put our students into colour houses. 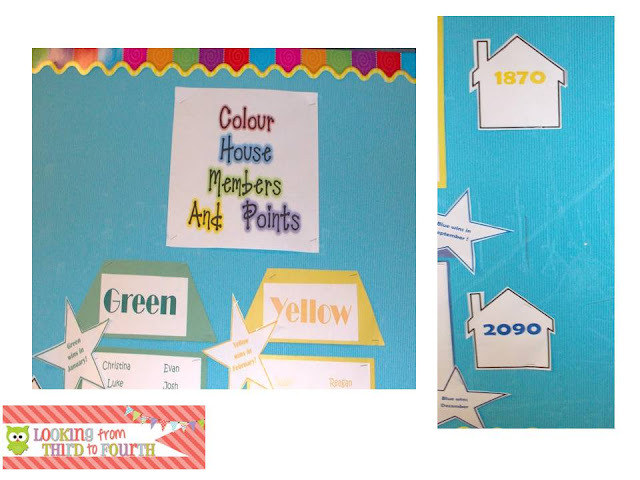 We divided our school into 6 color houses (we have a small school) with one teacher being in charge of each color house. We sit with our color house at assemblies, we earn valuable (?) color house points by having the best cheer, or the best dance moves or the fastest time in a relay. We make color house flags together, we play Name That Christmas Song together, we participate in Winter Fun games as a color house and Summer Fun day too. Students are awarded color house points for dressing up on the theme day, winning a brag tag and participating in our activities (food donations, pumpkin carving contests, donating hats and mitts etc). Here is our points board. I am in charge of blue, the winner for two months (that is what the stars show) and my BFF is in charge of yellow house - yes we are motivated to beat each other!! Color houses have been a great way to increase school spirit at our school. The students are teamed up with other students from every grade and really work together as a team to win challenges. The cheer each other on and it is a great way to connect with students you don't teach. Color houses have also been a great way to motivate students to participate in school spirit days and activities. At the end of the year the winning color house has an ice cream party. Do you have color houses - if you do I would love to hear what you do with yours - it is hard to keep coming up with new and fresh ideas. I've never heard of this, but sounds so fun!! What a great idea! I LOVE school spirit! I wish our school did something like this! What a SUPER motivator! Such a great way to build team spirit and community in your school! Thanks for linking up and sharing! I VOTE all schools implement this!